Signal Halyards? Several feet forward of the flag bags there is a rail, much like a hitching post in an old west town. I see the hitching post rail on the Iowa now. But I am pretty sure that rail wasn’t there during WWII. No drawings or photos of that part of any of the 4 ships from that era shows such a rail. Also, the location of that rail aligns with back edge of the extension to balcony outside the chart house one level above on level 04. There is even a row of eyelets at the edge of 04 level extension for halyard to thread through. But that extension was added during the 1980s modernization. Prior to 1980s the aft end of balcony on level 04 terminated a few feet further forward, and aligned with the support stanchions of the 40mm quad bofor tub on 05 level. So it seems to me that hitching post rail was added during the 1980s as well. Currently there is a canvas cover over the flag bag. I will have to look at the photos I have, but the Iowa's are a little unique in that both sides of the flag bag is easily accessible. Sounds like photo search time! Good luck! Large double page spread on page 96-97 of "Battleship New Jersey" shows the halyards tied off inboard and even with the fwd edge of the flag bag. The ship is not underway and crew is manning the rail for the photo. The scariest aspect of the photo is a line of sailors sitting on one of the 16" barrels, all the way out to the end! Page 68 of the paper Floating Drydock book shows a 3D sketch (not to scale) of a flag bag. It shows a flat bar with half a dozen belaying pins inserted. The halyards were tied off to the belaying pins, similar to the rigging on a sailing ship. For those with the electronic copy, on the page is detail of the 5" practice loading machines. Another question, for the halyards on the mainmast, where did they tie off on? Trumpeter helpfully provided a third flag locker for the space between the aft funnel and the 5” practice machine, and Pontos helpfully provided a belaying pin rail for it similar to that provided for the other two flag locker. But Trumpeter May have simply extrapolated without direct evidence. All the plans and the big Gibbs and Cox model l’ve seen suggests there wasn’t a flag locker there during WWII. But pages 160 and 162 of the electronic float drydock plan show a rather hefty “tie rod” cantilevered from the back of the aft funnel and offset to starboard. There is none on the port side. Is this where the Halyards for the main mast tie off? Does halyard from the port side yard arm acrossove the centerline to tie off on the tie rod on the starboard side? If you blow up this image from Navsource: http://www.navsource.org/archives/01/016341c.jpg. you can make out the signal halyards. It appears a couple of halyards are attached to the front of the flag locker, but most of the halyards are threaded further forward to a frame mounted on the back of 04 level balcony. This makes sense while the ship is in operation actually. Because directly under the bulcony, forward of the flag locker and behind the flag plot, is an armored battle signal compartment, with armored glass vision slits and a large round hatch on the wall facing diagonally towards the back. This hatch is unusual because there is a fat round coating all around it. Several sources say this is an escape hatch. That makes no sense. Why would the escape hatch be round, so small a person has to squeeze through, and 5 feet off the deck? Why the fat coaling? I believe this round hatch is open during the battle to allow signal halyards, threaded through the frame just behind and above it, to come into the battle signal station. The fat coaming is prevent the halyards and signal flags from snagging on the rim of the hatch opening. My theory is In battle the signal flags will be set inside from the protected battle signal compartment, and then hoisted out through the hatch up to the yard arm. Last edited by Timmy C on Thu Nov 08, 2018 12:35 pm, edited 1 time in total. This shows the area in some more detail. Not the possibility of a set of light and dark halyards. The overhang of the 40 mm tub above somewhat complicates the use of signaling from the 04 level. Indeed the hatch which appears to be of a countrballanced type may well be for passing flags through from behind a splinter protected space. Whether or not this was used to any extent in this manner, who can say. I do have closeup photos of this hatch from Missouri and included it on my scratch 1:192 modern ship. Chuck you are correct I think. Page 60 -Flag Signal Level FR. 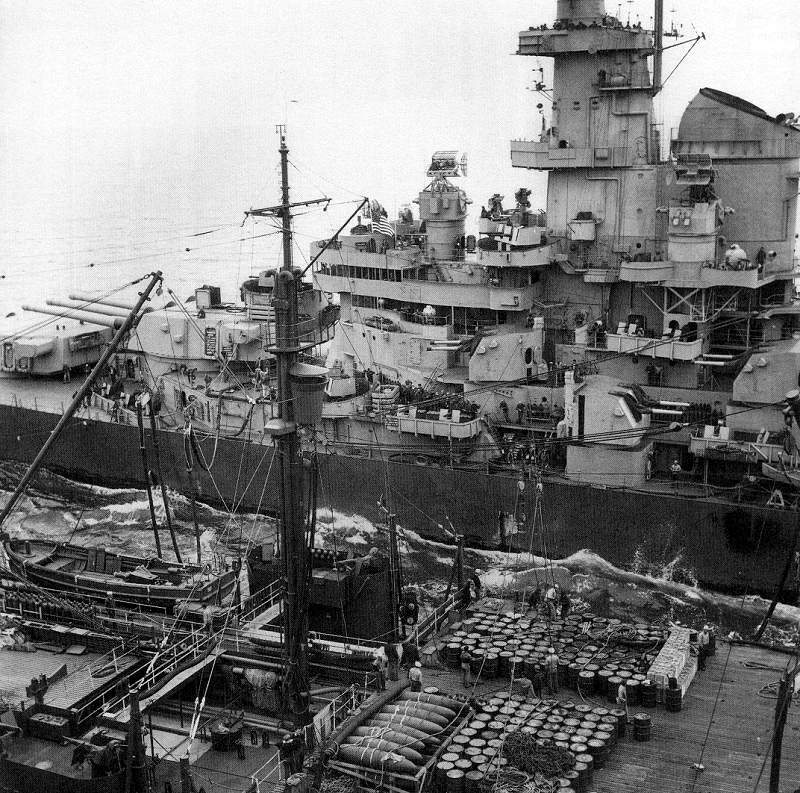 115-136 shows 2 sets of 5 belaying pin rails on the port and starboard sides just next to the two 5" drill ammunition lockers and forward of the rear flag locker. I believe that small hatch which looks a bit like a toilet seat is where the signal halyards were fed through. This is an armoured control centre and the idea was that during a shooting battle the signals flags could be sent from this armoured centre with no danger to the personnel operating these signals. The halyards were fed through a kidney shaped frame down to the "toilet seat" opening into the armoured room. On the plan I believe it is incorrectly labelled an "Oval Escape Scuttle". The kidney shaped feed is shown on Page 75 and labelled "Fairlead for Signal Halyards". I don't think these were ever used in a battle as at that time other forms of communication were being developed. The Fairlead for the Signal Halyards is shown on page 75 - Navigation Bridge Level. Page 58 has a photo of the "toilet Seat" scuttle and an overhead photo of the starboard flag bag onboard USS Iowa in 1986. It states that "the belaying pins and rail are made of brass". I would suspect that this was typical for all the IOWAs at the time. The pipe rack tie-off in front of the flag bag was still there when she was re-activated for Vietnam War service. Covered, but one can see the original rail in front of the bag. Does anyone know where I can find a reference on type, function and location of ECM Antenna on the Missouri in sept 1945? Floating Dry dock shows a number of different dipole antennas in foremast, sides of the tower bridge and on the aft funnel. I don’t think floating dry dock is complete because the depiction is rather haphazard. Most antennas shown appear only in one drawing, and missing from other drawings showing the same location. Also the antennas are often depicted as being on one side of the ship even though the drawing show both sides. Dipole antenna on either side of the SK-2 radar platform. A single dipole antenna with prominent insulator at the rear of the SK-2 platform. Dipole antenna on either side of foretruck SG radar service platform. A ECM radome on a small cantilevered frame on the starboard side fog horn platform. 2 dipole antennas on the search light tub on the rear funnel, one with a prominant indulator. 1 dipole antenna on the service platform underneath the searchlight tub on the rear funnel. Does the FDD book specify an exact date? The problem one has is that the antennas changed every time the Missouri went into a shipyard. The changes among the Iowa class were dramatic throughout the war. The FDD book depicts the Missouri in Tokyo Bay at the signing of the Japanese surrender in 1945.
painted as the exhaust would not be evenly distributed across the entire mast. That’s right. But on the Iowa class it looks like sometimes the main mast was painted black, sometimes painted haze gray and allowed to be stained by smoke. So I wanted to what the Missouri had in sept 1945. For example, when the Iowa was first commissioned in New York, she wore measure 22. her main mast was haze gray. When she wore measure 32/1b, it appears from photos that her main mast has been painted black and appears to have remained totally black, with two bracing struts painted black from the level of funnel top and Up. After her hunterpoint refit in early 1945, she was repainted in ms 22 again, and it appears the new mainmast was painted haze gray, and was never repainted black until the end of the war, but allowed to be stained unevenly by stack gas. When Missouri wore 32/22D, it appears her main mast was painted black. But she too was repainted to measure 22 in mid 1945 at Ulithi, I believe. Hence my question of whether main mast was painted or stained in September. Photos seem to show the whole mast is black, which suggests painting, but it is not certain. If you'll accept photos from her return home, they seem to show the same "two bracing struts painted black from the level of funnel top and Up" as the Iowa. Was that when she had her name painted on her side for the victory review on Hudson River in New York? She as clearly been repainted by then, with new nonstandard measure 22 that was navy blue all the way up to main deck everywhere along her length, and with both net fore and main mast painted black if I am not mistaken. While this may not be more than an observation, I've looked over NavSource photos, NARA photos of BB63 during the period of the Japanese Surrender and would have to say that the main mast was painted black and the foremast gray. This paint scheme seems to be constant with photos of MO up thru 1946 in Greece and even some of the 1948/1949 photos of her.